INTI International College Penang (IICP) has joined forces with Motorola Solutions to promote innovative learning among local university and college students. As organizer and sponsor of MOTO Innocup 2013 respectively, IICP and Motorola Solutions have introduced a challenging intervarsity embedded system software competition to cultivate present and future generations of solution providers. 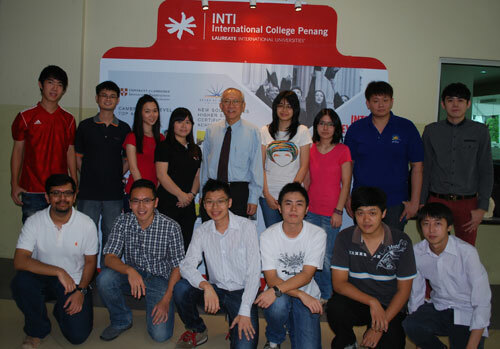 INTI’s finalists for the MOTO Innocup pose with Dr Michael Yap (with tie). Going by the theme Gesture – Next Generation Smart User Input Device, MOTO Innocup 2013 aims to develop an application/system that can intelligently detect motion and utilize gestures to control the application/system. Open to all students currently pursuing their undergraduate studies in public and private institutions of higher education, the competition requires all participating teams, each with a maximum of five members, to describe their software by means of user stories, use cases and scenarios. Among the six finalists of the competition are three teams from IICP. In December 2013, they will compete with teams from KDU and University of Nottingham for a grand prize of RM 5,000. Each team will also be awarded a maximum of RM 3,000 to fund their projects. One week prior to the finals, each team is to submit a report describing the achievements and shortcomings of its application/system. The finals itself will see poster presentations and project demonstrations by the finalists. The quality of projects will be evaluated by Motorola Solutions’ technical panel to decide the winner. Innovation brings multiple industry projects that enable INTI’s students to work with employers on real business issues and solutions to gain experience and readiness for global employability. Students have undertaken over 160 innovative projects from 2012 up to June 2013 in collaboration with industry partners. Real employer projects ranging from “Ways of doing business and how to setup a company in Myanmar” to “Development of a research book that identifies the changes shaping Malaysia’s marketing landscape and consumer behavior trends” have been introduced in the classroom to help students develop problem solving, collaboration, communication and critical thinking skills. For more information on innovative learning at INTI, call 04-6310138.